Following we repropose some passages of the conversation that Gariwo Chairman Mr Gabriele Nissim had in 1999 in Budapest with Gyorgy Litvan, a Hungarian historian, friend and fellow inmate of Istvan Bibo. Bibo was a very sharp-witted person, but even sharper was the force of his conscience. Bibo could be defined as a walking conscience, the very embodiment of conscience. In prison, we were close to each other. He helped me in my translation work, I had been assigned to translating historical essays, jurisprudence, espionage and legal essays, Churchill’s, De Gaulle’s, and many other people’s memories. Bibo helped me translate from English, he was far more experienced than me. Then he was moved to a harsher jail and I myself was moved to another branch of the prison. We were in Vatz, on the Danube. In Summer, he too toiled with a wheelbarrow to upload from big ships the coal for the prison and the bricks, thousands of bricks for a factory they were building near there. But then Bibo could not work any longer, because he fell ill due to high pressure. His health was more and more ailing after his release, and he was forced to spend longer and longer periods at the hospital, until his premature death. Bibo was a very sweet, charming and fine person, with a great self-irony and a wit, which was never vitriolic. He never treated his adversaries violently, he never had ‘enemy-like’ attitudes, but he always faced controversies smoothly. In prison, too, where the other inmates confronted the guards rudely, he never played the strong, but rather he always dealt with the others quietly; despite this, he was nonetheless considered as enemy number one. Policemen, in facts, knew Bibo was the most dangerous for the regime. When we defendants at the Nagy trial, after the verdict that condemned us to isolation, in 1959 were taken to Vatz and mixed with the other political inmates, our fellow prisoner Ganz had been summoned by a sergeant, who asked him some questions about Bibo. He asked him whether Bibo was an honest guy if he was very intelligent, and Ganz answered yes. Then the sergeant regretted the impossibility to do anything against him, or to find anything to reproach him. This is why he was deemed very dangerous. Bibo was as sweet as Jesus Christ. He himself, in one of the essay he wrote little before passing away, on the evolution of the European society (The reason of the evolution of the European society, one of his last essays, was dictated by Bibo to his son by the means of a tape recorder, and he then translated it, Editor’s note), he talked about the role of Christianity, which, despite all its faults, knew how to humanize the power, which is per se violent, and he underlined that it is always necessary to find a gesture of humanity, also in politics. He exemplified this with the very example of Jesus, who chased out the merchant from the temple, regretting that Christ did not find a more humane way to wage that battle. While in jail he never complained, on the contrary, he always found what was happening to him rather obvious. Such an idea of humanization was his way to face his relationships with the other, that was in his own character, and he conceived it also as a way of doing politics. He never compromised with the regime, and this is why the power was always intransigent toward him, and always isolated him. After his release, he had to work very hard, he was in this library, in the Statistics branch, and he worked above all in the basement. He had to select the books, catalogue them, move them, and as he was ill and weak, this job became more and more painful, but he never bowed his head. After his retirement, he always worked to follow his father-in-law first, then his wife, when they fell ill, despite the fact that his health conditions were even worse than theirs. Once, a friend asked him what he thought of Kadar’s regime and he answered that it was like honey: you could live in it, but you could not move freely, you could not improve yourself. Also toward those who had accepted a compromise with Kadarism, he never felt resentment. 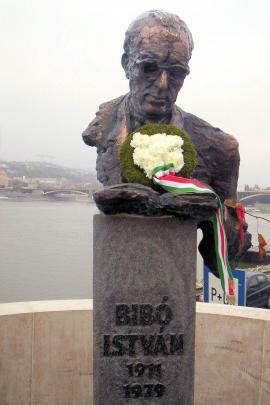 Bibo then retired from the public life. Only once he took part in a séance of the Academy, holding a speech, but the young people did not know about him and wondered who that man who said such interesting and clever things ever was: they had never even heard of his very existence. They did not even know about his gesture of 1956, when he remained alone in the Parliament during the Soviet aggression as minister of the government in charge. Bibo was a minister for only one day: the following day, Nagy was already sheltered in the Yugoslavian embassy and the other ministers had departed. Only he went to the Parliament. In order to understand this gesture, it is necessary to understand his deep moral persuasion. In fact, he was an outstanding man for his intelligence, conscience and wit. During his life he had become invisible, he had retired, but when he died, his funerals were attended by a thousand people: suddenly, the Hungarian intellectuals realized who he was, and the young people started reading his articles and searching the libraries for the old magazines where they could find his essays, as no collection of his writing existed. Once a month you will receive articles and events selected by Gariwo Editorial Board. Please fill out the field below and click on subscribe. The International Committee of the Armenian Righteous. Memory is the Future was founded by Piero Kuciukian in order to commemorate those who went against the genocide of 1915. The title emphasises the function of the memory, which is not a nostalgic look back in history, but a a clear sense of the past to build a future without making old mistakes. The memory has many solutions and presents conflicting results, either positive or negative depending on how it is treated. Reflections on the previous events help us to understand the present, which means to search for the coordinates that allow us to interpret new situations with awareness of the dangers or opportunities that are triggered by certain mechanisms such as cultural, social and individual. The experience of the genocides of the twentieth century, the phenomenon of totalitarianism, resulted in the devastating world war, the balance of power during the Cold War, provide very precise indications on the geopolitical hegemony and humanitarian frifts to be avoided, while the example of the Righteous, their varied efforts on behalf of the persecuted, the demand for freedom, independence of thought and the instance of the defense of human dignity, are to be taken to avoid the pitfalls of arrogance, denial of truth, the rejection of diversity, closing the other, unilateral decision.